It would be a relief to report with any certainty that the negotiations over the Trans-Pacific Partnership (TPP)--a massive proposed free-trade zone spanning the Pacific Ocean and all four hemispheres--are definitely empowering corporations to the detriment of workers, the environment, and sovereignty throughout the region. Unfortunately, the secretive and opaque character of the negotiations has made it difficult to report much of anything about them. What can be confidently reported about the TPP is that, in terms of trade flows, it would be the largest free-trade agreement yet entered into by the United States--and, according to a report by the Congressional Research Service, that the ministers negotiating the agreement "have expressed an intent to comprehensively reduce barriers in goods, services, and agricultural trade as well as rules and disciplines on a wide range of topics" to unprecedented levels. Yet despite these grandiose ambitions, details of the negotiations and drafts of the text have been purposefully withheld from Congress and American citizens. The secrecy surrounding the negotiations is breathtaking. In July, 134 members of the House of Representatives sent a letter to U.S. Trade Representative Ron Kirk requesting that the appropriate congressional committees be consulted and that a draft of the text be released. The members reminded Kirk that draft texts were circulated and congressional committees consulted throughout the NAFTA negotiations in the early 1990s. Their letter received no response. A month later, House members petitioned Kirk to allow a congressional delegation to observe the negotiations--as in the Uruguay Round of the General Agreement on Tariffs and Trade, the launch of the Doha Round of the World Trade Organization, and numerous NAFTA rounds. Despite its persistence, Congress has not been granted any significant oversight or insight regarding the negotiations. While Congress, the press, and the public have had to make do with leaked chapters of negotiations, Just Foreign Policy reports that 600 corporate lobbyists were granted access to the negotiated text. American democracy is in a sorry state when corporations are granted more access to even the text of sweeping government agreements than the public and its elected officials. Although corporate influence on U.S. trade policy is hardly a new phenomenon, the simultaneous waning of congressional oversight is all the more unsettling. In May, Democratic Reps. Barney Frank and Sander Levin wrote to Treasury Secretary Timothy Geithner to express their concern about the TPP's provisions entrenching capital mobility. Their letter requested "an official written statement of the U.S. policy" concerning the ability of parties to the agreement to deploy capital controls in the face of a financial crisis. If the leaked drafts accurately reflect the direction of the negotiations, countries that instituted capital controls could be taken to court by private corporations and could be held liable for damages. Hundreds of economists signed letters in January and February 2011 opposing these provisions, yet the investment chapter leaked in June suggests that neither their concerns nor Frank's and Levin's were taken into consideration. Other troubling trends have emerged in the leaked chapters. According to Citizen.org, the negotiations thus far have given corporations the right to avoid government review when acquiring land, natural resources, or factories. They have also banned corporate performance requirements, guaranteed compensation for the loss of ""expected future profits' from health, labor, [or] environmental" regulations, and included stunning provisions concerning the right to "move capital without limits." If these are indeed terms of the TPP, then the agreement would make it nearly impossible for countries to hold corporations accountable for their conduct--and would in fact hold governments liable for any "damage" incurred by corporations due to the institution of regulations. Many progressives had hoped that President Barack Obama would shift U.S. trade policy away from staunch free-marketeering. But according to Lori Wallach, the director of Public Citizen's Global Trade Watch, the leaked chapters of the TPP "sent shock waves through Congress because it showed that U.S. negotiators had totally abandoned Obama's campaign pledges to replace the old NAFTA trade model and in fact were doubling down and expanding the very Bush-style deal that Obama campaigned against in 2008 to win key swing states." The struggle over the Trans-Pacific Partnership reveals a disturbing trend in American politics. The much discussed Citizens United ruling granting corporations personhood has given way to a trade negotiation process in which corporations are granted more rights than American citizens, their elected representatives, or foreign governments impacted by the deal. 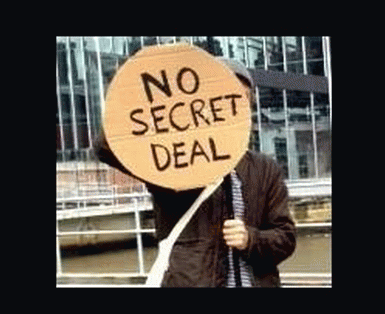 That trade negotiations with such an immense potential impact on numerous sectors of the American economy have been conducted in secret is troubling enough. To consider that those negotiating the treaty have willfully ignored experts and elected representatives in favor of corporate interests calls into question the sustainability of American democracy. Hilary Matfess is a student at the Johns Hopkins University. She has contributed to the Epoch Times, CounterPunch, Nation of Change, and Foreign Policy in Focus.